Resurrection Kings may give some listeners a case of Yogi Berra's deja vu all over again. This act is made up of some familiar LA hard rock and heavy metal veterans. The founder is guitarist Craig Goldy, probably best known for his work with Ronnie James Dio, in DIO. Also a DIO alumnus is drummer Vinny Appice. 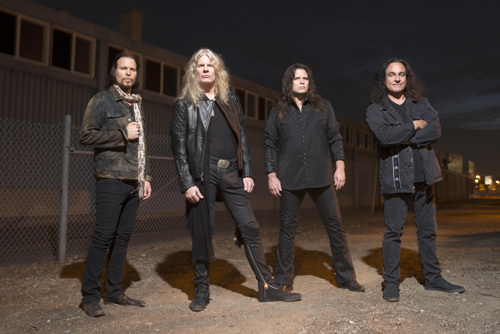 Then, on bass there's another Eighties veteran in Sean McNabb (Lynch Mob, Dokken, et al) Finally, for the vocals, Goldy nabbed journeyman Chas West whose resume includes Bonham, Foreigner, Tribe of Gypsies, and more. The band releases their self-titled debut on Frontiers Music. Now, having read the above, you probably already deduced what kind of music you're getting here. Yep. You would be right. Classic melodic hard rock infused with a heavy metal edge, and deliberately guitar driven. It's more than obvious that Goldy' significant guitar skills, from riffs to solos, form the core of the songs. He really is a guitar wizard, easily switching from a blues style in Path Of Love, to psuedo neo-classical fireworks in Never Say Goodbye. Just because Goldy's guitar has some prominence is not to say that songs are devoid of melody and harmony, crafty hooks in lyrics and arrangements, or strong rhythm and groove. Quite the opposite. It's woven together so that you're his fine guitar work within a well-crafted song. And, really, that's the only way it can make the Resurrection Kings gig work. As much as I love lead guitar, I can only go so long in album listening to just guitar. Returning to the metal edge for a moment. Another characteristic which defines nearly the entireity of this album is it's inherent heaviness. The riffs are big, the bottom end possibly even bigger. This is definitely a heavy metal album. Had Enough, Who Do You Run To, and Silent Wonder easily fit this bill. Alternatively, Goldy and company are not without some AOR sensibility and accessibility. They can write some tunes that are downright catchy, heavy, but catchy as with Never Say Goodbye and Fallin' For You. Another heavy, catchy, number which might remind some listeners DIO-era Stand Up And Shout is Livin' Out Loud, the demo that convinced Frontiers Music to give Goldy the push. In the end, I had to wonder what Resurrection Kings reminded me of. Maybe some mixture of DIO, Kingdom Come, and Whitesnake. But you may hear something different. Otherwise, Resurrection Kings' debut album is a strong one: entertaining guitar-driven melodic hard rock with a metal edge. Recommended. 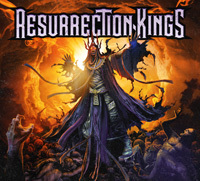 Resurrection Kings' debut album is a strong one: entertaining guitar-driven melodic hard rock with a metal edge. Recommended.